Dolphin Yard is the name given to Burley's Barge-yard which was once also the location of their Dolphin Brand Cement Works. The site includes the original sail loft and forge which have been converted to a museum devoted to the history of the Thames Sailing Barge and the associated industries of brick and cement making which once sustained the local fleet of barges. On display is a large collection of shipwrights', blacksmiths', and riggers' tools as well as models, plans and photographs. The associated barge yard includes the original barge repair blocks, boiler and steam chest and other facilities for the repair of traditional craft. The inlet alongside the Museum usually contains at least one vessel brought to the yard for restoration, including the famous sailing barge 'CAMBRIA' the last UK vessel to carry a commercial cargo under sail. 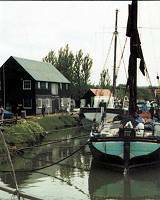 Dolphin Yard is located on Milton Creek, a tidal inlet running from Milton and Sittingbourne to the Swale - the tidal channel separating the Isle of Sheppey from the mainland. The heyday of the creek began in the mid-19th century when the first of a series of paper mills, cement works and brickfields was introduced. Fleets of vessels brought in London sweepings and sand for bricks, mud and lime for cement - and took away the finished product. By the Second World War the creek (whose yards had produced over 500 sailing barges) had seen its best. Throughout this period of decline the yard of Charles Burley remained. Based on Burley's 'Dolphin Brand' cement works, the yard continued repairing barges until about 1965. By 1968 the site was owned by Bourncrete Limited, manufacturers of concrete products. The yard was then leased to the newly established Dolphin Sailing Barge Museum Trust who saw it as one of the most unaltered small shipyards of its type. Architecturally the buildings are unimpressive but have an honest appeal, constructed on a massive scale. The forge has as its main supports sawn-up barge tillers while in the sail-loft many of the main beams and supporting posts have come from sailing vessels. With the establishment of the Trust and the restoration of the yard the connection between the town of Sittingbourne and its creek has been re-established. Cambria - the last UK vessel to carry a commercial cargo under sail. Cambria is a handsome vessel and has always attracted interest since the day of her launch in 1906. She has been the subject of a number of books and television programmes and is a fine example to choose for complete restoration and preservation. A primary aim of the restoration is to ensure that an example of the Thames Sailing Barge is regularly open to the public view. The barge yard facilities at Dolphin Yard will help ensure the restoration of the vessel and provide for her continued maintenance on a day to day basis. Once restored the CAMBRIA will continue to be accessible to the public, moored alongside Dolphin Yard and will also be sailed by youth and community groups.